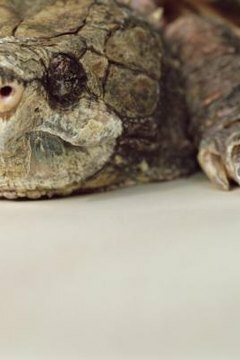 You might not notice a snapping turtle at the bottom of a waterway until she strikes at prey with powerful jaws at the end of a neck that extends nearly the length of her body. She'll mate during spring or autumn, retaining her mate's sperm in her reproductive tract for up to several years. When conditions are suitable, she'll leave the water to lay eggs the size of ping-pong balls as far as a quarter-mile away. Buried in a bottle-shaped hole 6 to 8 inches deep, the eggs develop in 55 to 125 days. The mother abandons the nest immediately after laying the eggs and covering them over. If you should uncover a nest, the best course of action for keeping the eggs alive is to gently cover them over again and let nature take its course. If the eggs are in danger from predators, you can gently remove them to a safer area, taking care not to shake or rotate them. Before removing the eggs from the nest, mark the top of each egg with a nontoxic marker so you can keep them in the same position as they were laid. Candle the turtle eggs by holding them up to a bright light -- such as a pen flashlight -- in a dark room. The light will illuminate a web of blood vessels in a newly laid egg and will show the dark form of an embryo as development progresses. Eggs that show neither embryo nor blood vessels is not fertile and should be discarded. Incubating your eggs can be as simple as placing them in a sand-filled bucket in a warm area of your home or building an incubator to keep the eggs at a precise temperature. Fill a 5-gallon aquarium with 7 to 8 inches of sand to house the eggs and place the entire aquarium inside a 10-gallon aquarium. Fill the outer aquarium with water, maintaining it at the desired temperature with an aquarium heater. Place an additional thermometer in the sand to monitor egg temperature. Keeping the eggs at 68 degrees produces only female turtles, while temperatures at 73 to 75 degrees produce only males. Keep eggs at 70 to 72 degrees for a mix of both genders. While it's unlikely that all 20 to 30 eggs in a clutch of eggs will hatch, you may find yourself with a dozen or more hungry little mouths at the end of the 2- to 3-month incubation. Newly hatched turtles are the size of a quarter at hatch, and grow to about 6 inches long in their first year. A 10-gallon aquarium can house two to three hatchlings, provided you supply adequate filtration, water as deep as their shell is long and a basking area to get out of the water. If you choose to release them back into the wild before they have a chance to increase their size, realize the babies may fall prey to raccoons, skunks, birds and frogs. How Long for Freshwater Snails to Hatch?